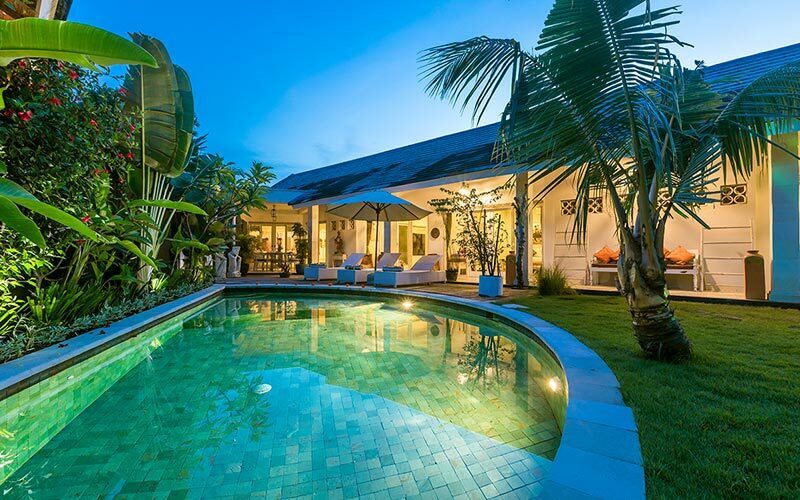 Villa Kaly, Villa Aksara, and Villa Zayya are located in the heart of the trendy neighborhood of Oberoi, 250m from Seminyak Square, 700m from seminyak beach, and within minutes of all convenience stores and some of the most beautiful restaurants and shops in the Seminyak area. Made with a combination of modern and traditional architectural styles, this vacation rentals will assure you comfort and pleasure. These 3 gorgeous villas are connected by 2 pretty wooden doors and can accommodate up to 27 person. The main building is in a Joglo concept (Indonesian traditional house in old teak woood), the solid structure by centenary wood material that shelters the living room, TV area, the open-plan kitchen with the dining room. This spacious place offers a friendly ambient in a sophisticated decoration. Opened on three sides, you will enjoy a better view of the luxuriant tropical garden. In each side of the house, two modern and cozy bedrooms are accessible through their bay windows giving a garden view. Moreover, both bedrooms are equipped with a spacious dressing area and large mirror at your disposal. You have review for Villa 12BR-oberoi-bali?